Wonderful, wonderful. It's great to live in a place with access to village and rural life as well as metropolitan beauty, like you do. The architecture is so beautiful and the whole area is so clean. What is a beautiful city hall. I like those fine deatails. c'est une belle architecture, et une belle mairie, la notre est trop moderne à mon gout, j'aime bien cella là, elle raconte une histoire. it's a beautiful architecture and a beautiful town hall, ours is too modern for my taste, I like cella there, she tells a story. nice series of photos. i really like the architecture. What a beautiful building! I really like that little dome on top! Fantastic shots - I sure love the architecture - it's just so beautiful, so much more so than in my part of the world! 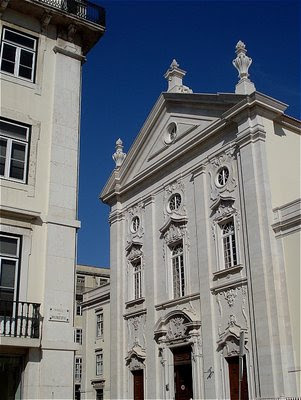 I remember seeing these buildings when I visited Lisbon. The architecture is so elegant and captivating. The white provides a nice palette for the ornate styling. I also loved your see photos with the surfers. Who would go out in those waves. Only true die-hards. Your bell towers were also stunning. Great captures. 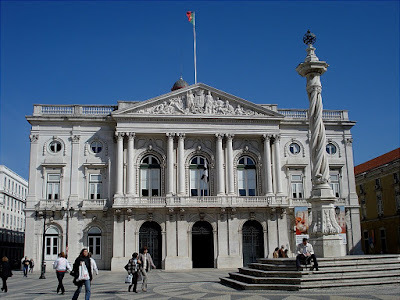 We visited this City Hall square on our trip to Portugal. Correct me if I am wrong, but I recall that our guide told us that the twisting rope-like design of the column that you have shown in the photo is called Manueline architecture, and it is used in other building elements in Portugal. It was made popular and named after a King whose name was Manuel. When I see your city hall and think of ours, I could cry. How fortunate you are to live amongst these gorgeous buildings. YOu capture them so well JM. Now that looks like a city hall. So ornate and majestic looking. wow it's so white !! !beautiful blue sky too ! This is so beautiful, I would love to visit this place! David, you have a fantastic memory! In fact we do have a manuelin style, which is a gothic variation (also called gothic-manuelin) after King Manuel I (1495-1521). This pillory is 'modern' (late 18th century) but it was inspired by that architectural movement. Majestic. And more of that stunningly blue sky! This was a very nice architecture. This is a gorgeous area. Just can't find much along these lines in the States. I notice that Spring is well underway down in Portugal! Tks for dropping in. Yes, it's very nice! I know it (and also some nice restaurants round the corner)! These are beautiful shots of beautiful buildings. City Hall looks so historic, ornate and clean. Not the case in Salem with its modernized design. 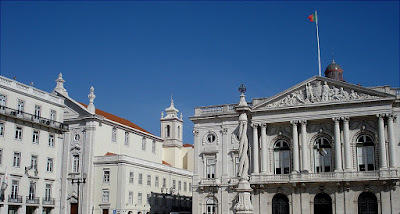 If these are just examples of the historical architecture one can find there, it looks like Lisbon is one of the most gorgeous cities in the world! What a classically beautiful square! Wow..those colours against the sky. The architecture is very striking. Are the buildings made from local stone? It's hard not to be mesmerize by the purity of the white and blue ! !